“Tia kot el rodech meng kmal di mo kall er a blai”. 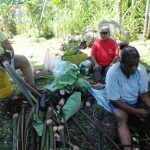 This is the first harvest so it will all be consumed at home, said Ms. Itong Sebaltas she sat at the edge of her Meseior taro patch on Friday, March 9. Itong is one of the 14 women that own and/or cultivate 20 Mesei in Ngerubsang of Melekeok State who are the direct beneficiaries of the USAID funded project implemented by Palau Conservation Society (PCS) entitled Reviving Traditional Croplands to Improve Community Climate Resilience. Itong is the Legislative Clerk for the Melekeok State Legislature, working full time from Monday to Friday and sometimes on evenings and weekends leaving no time or energy to cultivate her Mesei. The Mesei in Ngerubesang, Melekeok State are also vulnerable to salt water inundation and intrusion resulting in many inactive or abandonedMeseiin this area. Like many others in the project site, Itong’s Mesei has been abandoned for several years and was cleared and replanted approximately seven months ago in August 2017. The harvest yielded 100 lbs. 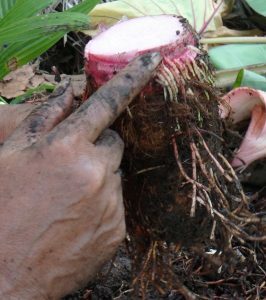 (72# Klabormother corms, 28# Sodech or baby corms) of taro resulting from 100 taro seedlings planted in only one of several bluu or plots of Itong’s Mesei. Although Itong does not market her Mesei produce, she is amazed at the yield and the potential earnings just from this one bluu. Today uncooked taro sells for$2.50/pound easily earning $250 from the corms alone. 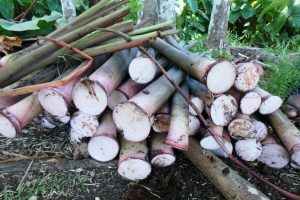 The 100 taro shoots originally planted yielded 100 new seedlings resulting in 200 seedlings in total. The market price for seedlings is $0.25 each therefore the 200 seedlings can be sold for $50. 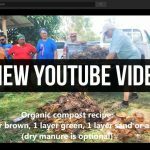 Yet another product are the newest taro leaves which are used to make one of Palau’s famous delicaciescalledDemok or taro leaf soup. Restaurants around town sell a bowl of Demokfor $4. 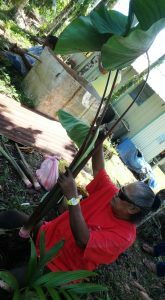 Sold to any restaurant, the taro leaves harvested can easily make another $75. This brings Itong’s total potential earning to about $375 for only one of the several bluu in her Mesei. The cost associated with reviving this one bluu is about $109 (seedlings: 100 x $0.25; labor: $3.50/hour x 24). The profit remaining is approximately $266 just from this one bluu harvested on March 9. A typical Meseihas an average of 21 bluu, you do the math. 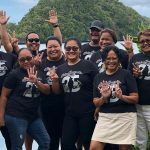 Though part of the global society, we Palauans are still very much in touch with our culture and traditions with principles rooted in the family, community consensus and support. This was demonstrated during the harvest on March 9. According to traditions, the first harvest is always shared with immediate family for tasting and quality testing. As well, Ms. Sekang Antonio and Ms. Svetlana Kadoi who are also Mesei owners/cultivators in Ngerubsang assisted Itong in the harvest in what is called Omengerakl. This same practice applies to clearing and planting of the Meseiand is an investment ensuring you will have assistance when it is your turn. A survey done in 2016 with project participants demonstrated that a high percentage of the women participants of this project are the heads of their householdstherefore dependent on the products of their Meseito feed and support their families. 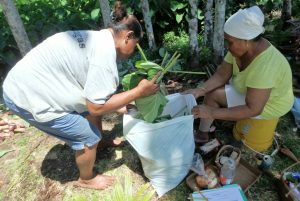 The revival of abandoned or inactive Mesei is part of the state and taro farmer partnership implemented in this project to offer professional Palauan women like Itong the opportunity to have their Mesei in production without sacrificing their careers. More importantly, the partnership is to ensure continued production of the Mesei to increase the earning potential of the women in the project sites. 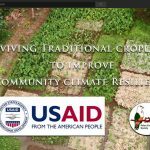 The overarching goal of this project is to build community resilience to climate change by focusing on watershed management and traditional soil conservation methods to ensure economic, environmental, and food security for the states of Melekeok, Ngaremlengui, and Ngarchelong. The revival of abandoned Mesei in these three states is only one of the activities designed to bring about these three pillars of climate resilience (economic, environmental, and food security), enabling effective recovery from natural disasters linked to climate change. This project is made possible by the generous support of the American People, through the U.S. Agency for International Development (USAID). Itong cleaning one of the 200 taros harvested from one bluu or plot at her Mesei in Ngerubsang, Melekeok. 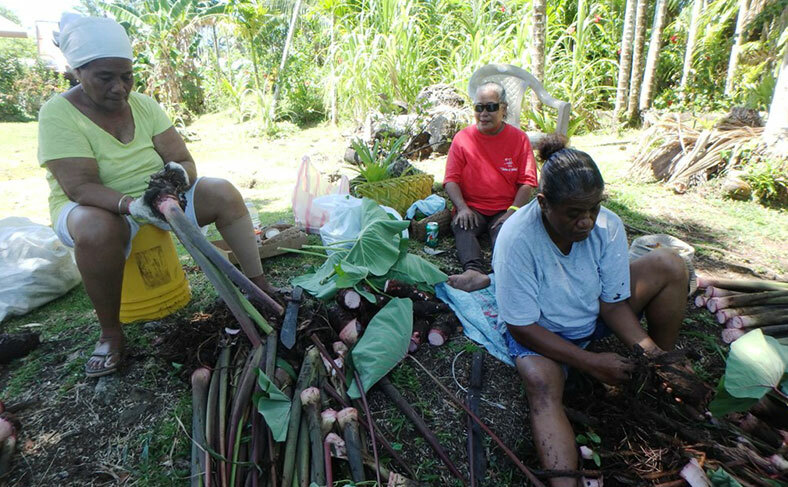 Sekang Antonio and Svetlana Kadoi assisting Itong with the harvest.